Amazon EC2 is the Amazon Web Service you use to create and run virtual machines in the cloud (we call these virtual machines ‘instances’). 1. Enter the EC2 Dashboard and click under Comput service “EC2”. 2. To create and configure your virtual machine click “Launch Instance”. 3. 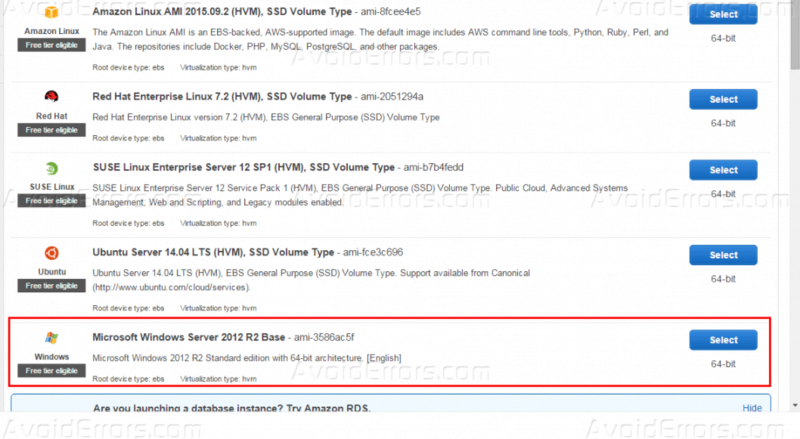 In the below screenshot, you can choose the Amazon Machine Image (AMI), which is a template that contains the software configuration required to launch your instance, For this guide, I will install Windows Server 2012 R2 Base. 4. Choose the instance type, every instance got its own specs such as processor speed, RAM, Hard-Disk capacity, you can know all the instance type from HERE, as for this tutorial we will choose the default “t2.micro”, and then I will click “Review and Launch”. 5. Now you can review all the options that you selected if its correct and you are ready and don’t need to do any modification click “Launch”. 6. 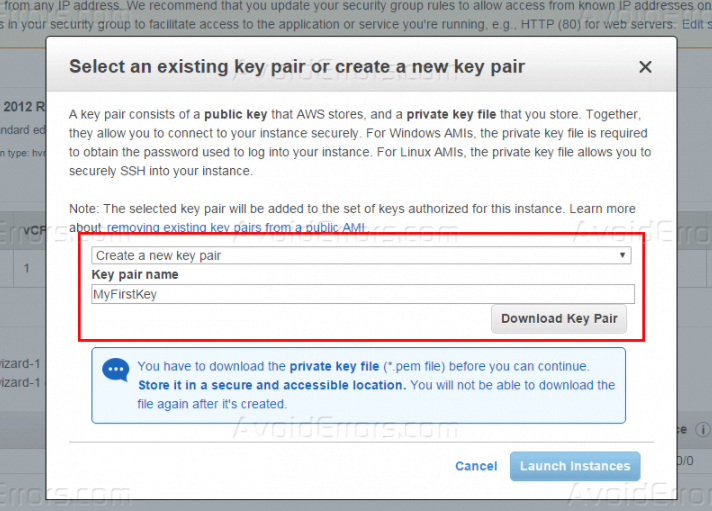 Before you connect to your created virtual machine you will need to have a pair key, after you clicked “Launch”, select Create a new key pair and name it for example “MyFirstKey”. 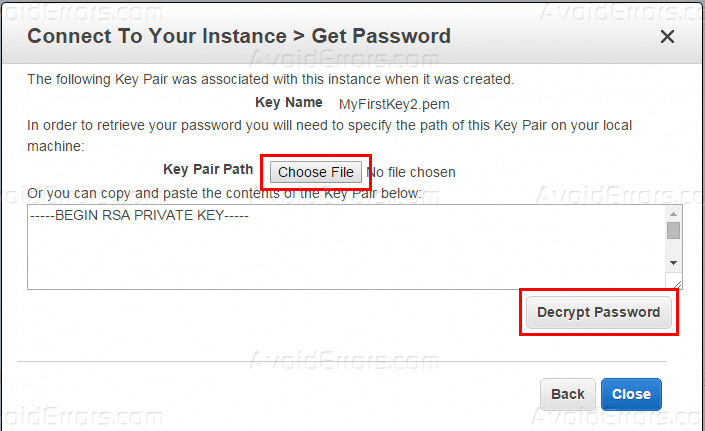 Then click Download Key Pair. “MyFirstKey.pem” will be downloaded to your machine, after that you are ready to launch. 7. The next screen after you had clicked “Launch Instances”, click on “View Instances”. 8. Now you are ready to connect to your newly created virtual machine, select the instance and click “Connect”. 9. Before you get connected, you will need a username and password the default username is “Administrator” and click on “Get Password” to receive your password. 10. To receive the password you will need to locate the key pair that we created in step (6), click “Choose File” and browse the saved file and then click “Decrypt Password”. 11. After you decrypt your own password (not the one on the below screenshot) save it in a secure location as you will use it to log into the Windows Server. 12. Next screen of the connection process, click on “Download Remote Desktop File” and then open it. 13. 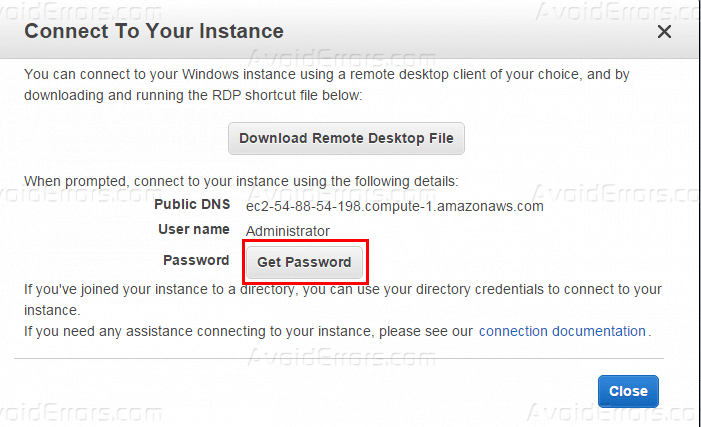 Now you can use the username and password that you generated to log into your created server. 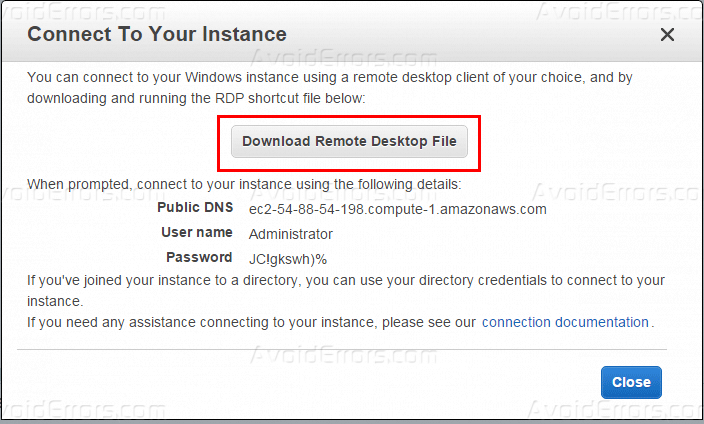 After this tutorial, you should be able to know how you can launch a Windows virtual machine on Amazon AWS without the cost and complexity of purchasing servers or managing data centers.